Conveyors are very helpful in moving material and supplies within a facility. However, they are a common cause of injury in a plant. We’ve compiled this list of safety practices that will help keep you and your coworkers safe. Conveyors are never meant to be occupied by a person. Conveyors have many features, including pinch points that can catch clothing or people and cause serious injuries. A limb stuck in a pinch point can be severely damaged or even torn off. Industrial conveyors are not designed for people so you should never ride on conveyors. Controls that don’t work properly can cause serious problems. 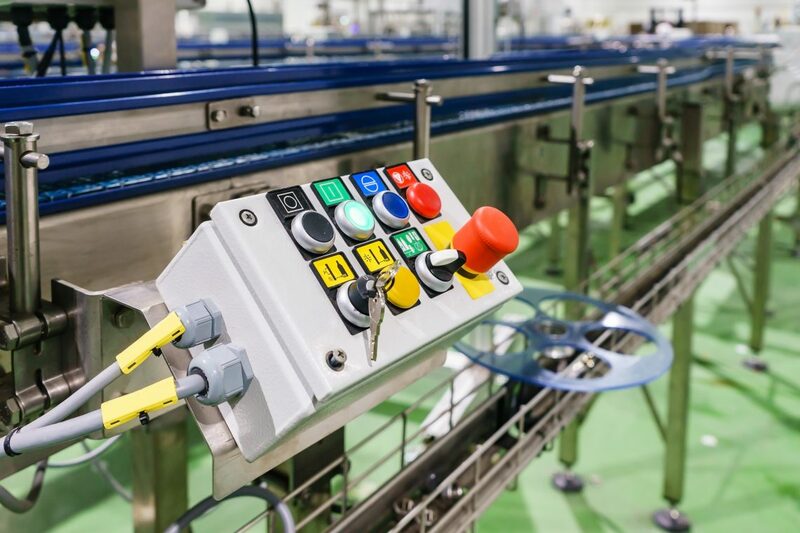 Inspect your conveyor controls to make sure no employee has misused, modified, or disconnected them. Controls should be easy to read and use, as well as easily accessible. Place emergency stops in highly visible and accessible locations. Conveyors can catch loose clothes or long hair, resulting in severe injuries. Make sure long hair is tied back or tucked under a cap. Don't wear bracelets, rings, watches, or other jewelry. Avoid wearing baggy clothing; remove ties or tuck them into your shirt. Don’t operate a conveyor if guards are not securely mounted. Conveyors contain gears, chains, belts, and other moving parts that can be hazardous if exposed. Employees should not be able to bypass, remove, or alter conveyor guards. Guard openings should be small enough to keep workers from entering danger zones. Conveyors are filled with pinch points by their very nature. The best way to correct an unsafe situation (e.g. loose guards, a person riding the conveyor) is to alert the person responsible for the area. Make sure it is clear who the point of contact is and how to reach that person. Training about safety issues and when to report them should be made available to all employees. Failure to do so exposes employees to life-threatening injuries. Secure conveyor systems before maintenance or repair by following proper lock-out/tag-out procedures. Lock-out/tag-out procedures prevent equipment from being powered up while maintenance or repairs are being done. Conveyor operators must be properly trained to perform lock-out/tag-out procedures. This ensures technician safety and optimal conveyor performance. Material handling equipment can be dangerous to those who do not understand how to safely work on it. When something needs to be fixed, contact your trained maintenance person. Only those employees who are trained to operate and perform maintenance on conveyors should do so. Now that you know these eight conveyor safety tips, share them with your employees so they know what to keep in mind the next time they’re working on, near, or around a conveyor system. Looking for more information on conveyor safety? Let's talk!